The Flash #49, by writer Joshua Williamson, artists Howard Porter, and colorist Hi-Fi, is part three of the Flash War arc, and the stakes are raised significantly in this issue. Previously, a reunion between Wally and his Aunt Iris sparked memories of his missing children from the pre-New 52 timeline. This lead to a meeting with Wally’s old enemy, Zoom, who convinced him the only way to bring his kids back would be to break the Speed Force. Believing this to be a terribly dangerous idea, Barry is trying his hardest to talk Wally down while chasing him around the world. Unfortunately, the speeds at which the two Flashes are running are causing all kinds of problem around the world, which draws the attention of the Justice League. 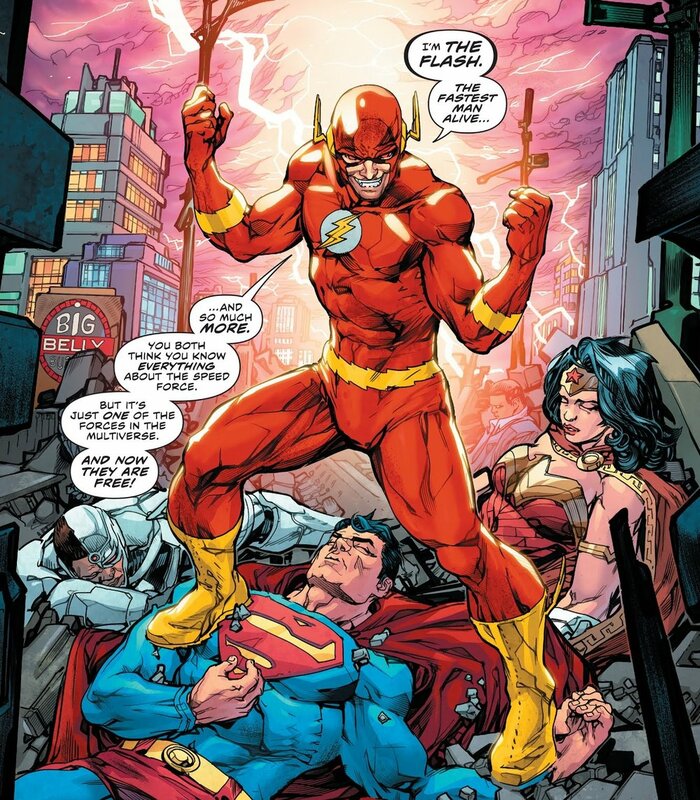 Williamson has really tapped into the best elements of classic Flash runs with this arc, making a race between the two fastest men alive feel very exciting, while mixing in high drama that might change this book for a long time to come. With both characters being presented as flawed human beings capable of making mistakes while wielding immense power, there is no clear hero in this arc. Barry calls out Wally for endangering the world to save his children, but, given Barry’s history of doing the same thing to save his mom, he doesn’t have a leg to stand on. However, instead of this making these characters seem like the villains of their own story, their mistakes, in many ways, make them more relatable. After all, who wouldn’t at least think about using time travel or some other dangerous method to save a loved one? There are also some fun moments of the Justice League trying to intercede in the conflict and being completely powerless to stop the Flashes. 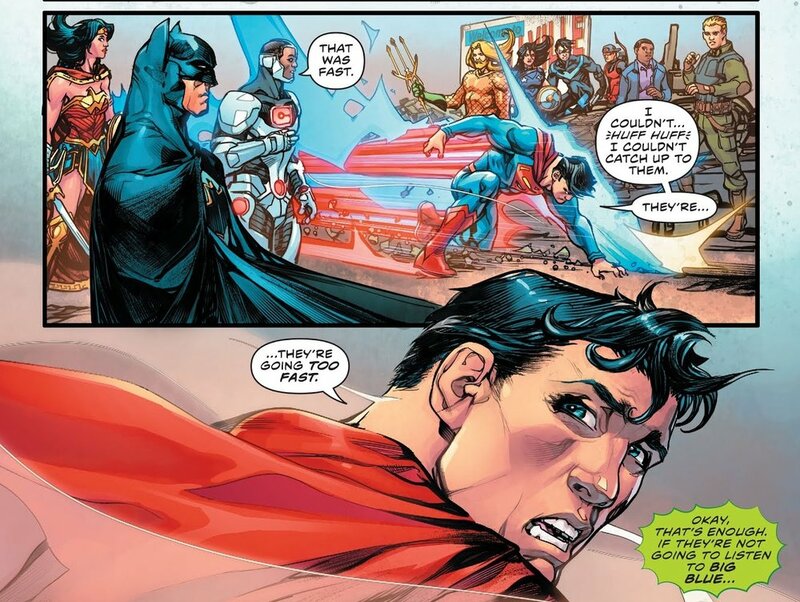 Between Superman not being able to keep up (that settles that argument) and the Flashes blowing through Green Lantern’s barrier like it was nothing, Williamson shows the audience why super speed is the coolest power on the planet. Another plus for this issue is Zoom. He is a complicated character who has always claimed that everything he did was to make Wally a better hero, but he has seemed to turn a corner with this story. His motivations are changed, and he takes a serious step up in power with this leg of the arc in a shocking scene that could end up altering the Flash mythos in a similar way to Geoff Johns’ classic Green Lantern run. Williamson is looking to add a few ingredients that will give future Flash writers a good bit more to work with if they spark with readers. Howard Porter’s art definitely shines in this issue, only improved by Hi-Fi’s electric colors. 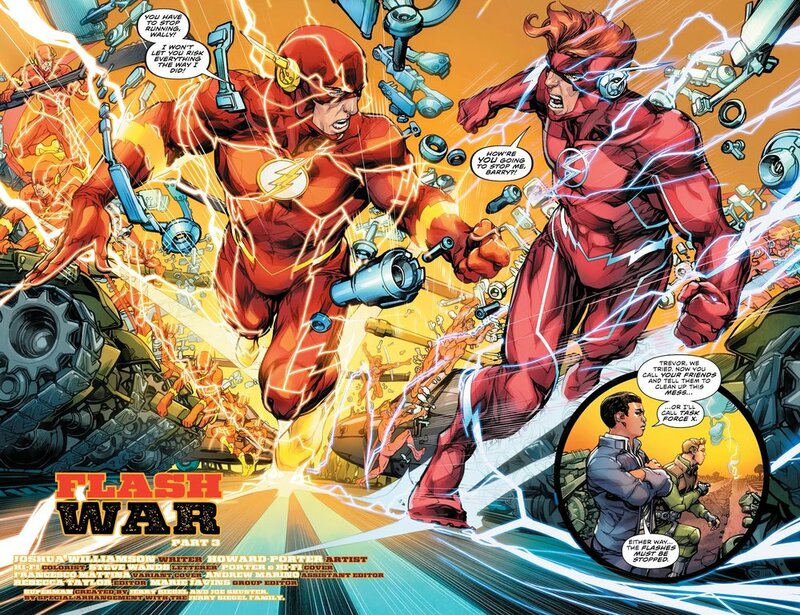 The art team was given plenty to work with in this epic race around the globe, including Speed Force lightning in just about every scene, and Barry and Wally trying to outrace and outmaneuver each other for the entire issue. A pro like Porter rarely disappoints, and he has been at his best the past couple of issues. If you’re a fan of his JLA work during Grant Morrison’s run, this is the issue you get to see him tackle the entire team again. All in all, this issue gives readers everything they could possibly want out of a Flash story and more, plus a shocking ending that will leave them wondering just where this arc is going to leave its protagonists. Any Flash fan, whether it be from the Barry or Wally eras, should be reading this story, because Williamson is delivering one of the best Flash stories of all time.